Do you want to tap into the power of Twitter to improve your social media reach and results? Understand how participants form communities and communicate on Twitter to improve your results! This is known as Twitter Community Structures. This community type holds 2 opposing viewpoints. It forms 2 discrete groups with little interaction between them. Each group focuses on a distinct set of websites and influencers. 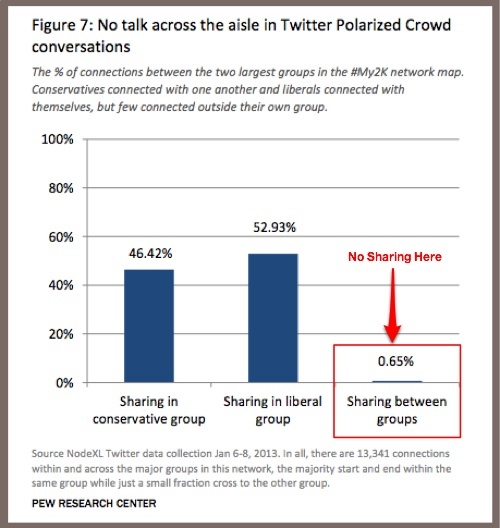 Polarized community tweets contain different hashtags and language, often around politics. Based on the analysis, there’s conversation between the 2 groups! Know your Twitter audience. Create a social media persona incorporating political perspective, information sources read and shared, and hashtags followed. Keep your tweets politically neutral. The exception is if you represent a political organization or cause. Tweeting political content can harm your ability to communicate with its opponents. This type of community has strong bonds with each other as well as strong connections across the group. Based on common interests, such as work or hobbies, these groups attract likeminded members passionate about the subject matter. These can be B2B, B2C or Not-For-Profit. 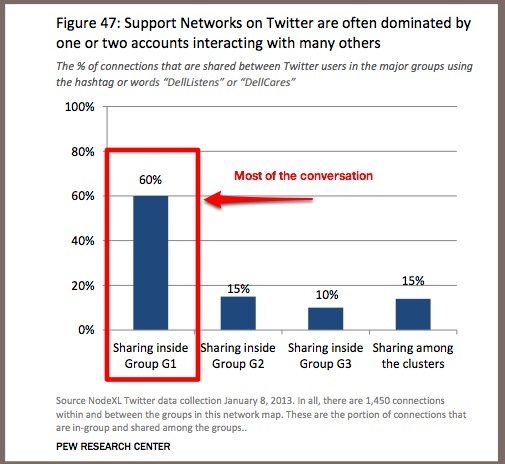 Here are 2 research charts to illustrate how the Unified Twitter Community works. You can see the cross group interaction. Leverage the power of unified groups for brands and offerings that have existing associations such as relevant business groups, conferences and interests. Provide information to support the community’s interests and needs. Focus on the 5 basic content formats as well as entertaining content. Position your organization to meet members’ needs. Be a useful resource. Use Twitter to extend your message reach. But obey the unwritten rules of social media. Don’t push or promotion your brand or product! Become a thought leader. High visibility, popular brands and celebrities attract large Twitter followings who tweet, comment and share information about them. BUT followers have NO connection to each other. When well-known brands or popular subjects like celebrities are discussed in Twitter, there are often many comments from participants who have no connections to one another. 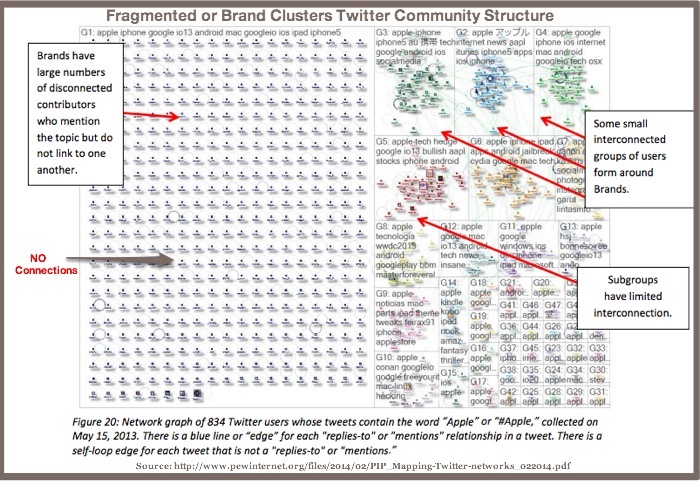 Here’s how Fragmented or Brand Cluster Twitter Communities look when analyzed. Note, the lack of connection between participants. 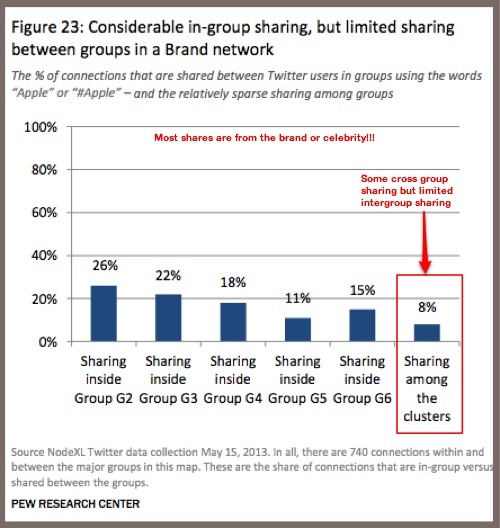 It’s interesting to note that in contrast to Polarized and Unified Twitter Communities, Brand Cluster Twitter Communities do very little of their own tweeting. 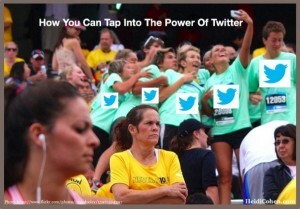 Use your star power to build your Twitter following. Since this type of Twitter follower doesn’t interact with each other, this follower base is mainly useful to distribute your message. BUT don’t expect your message to be relayed further or amplified!!! Have a plan to build engagement with your Twitter following. To increase the power of your follower base, test a variety of different methods for interacting with followers and encouraging them to interact with each other. 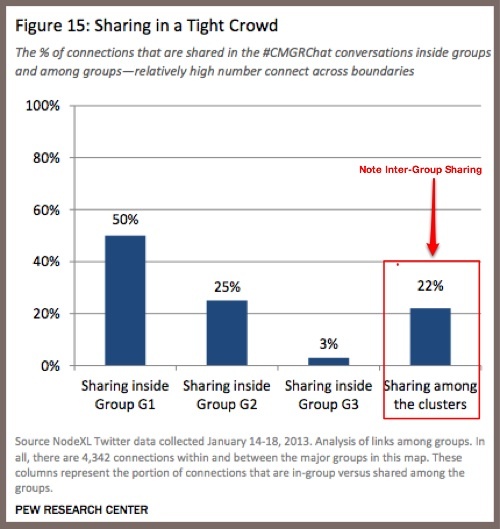 This has many of the same attributes as Branded Cluster structure but has evenly sized, densely connected sub-groups whose members contribute content. Each contains its own audience, influencers and information sources. 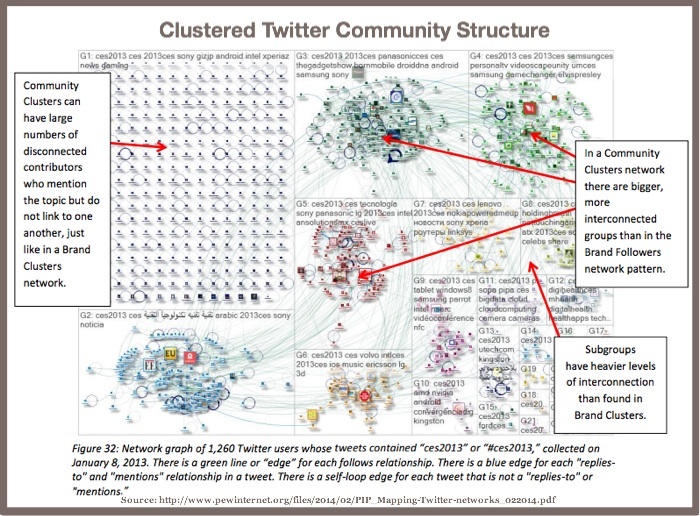 Visually a Community Clustered Twitter Structure looks a lot like a Brand Cluster Structure. The difference is that there are some moderately active sub-groups. But the graph below shows a striking resemblance. This example is from a conference and shows the power of leveraging your message beyond your live event. 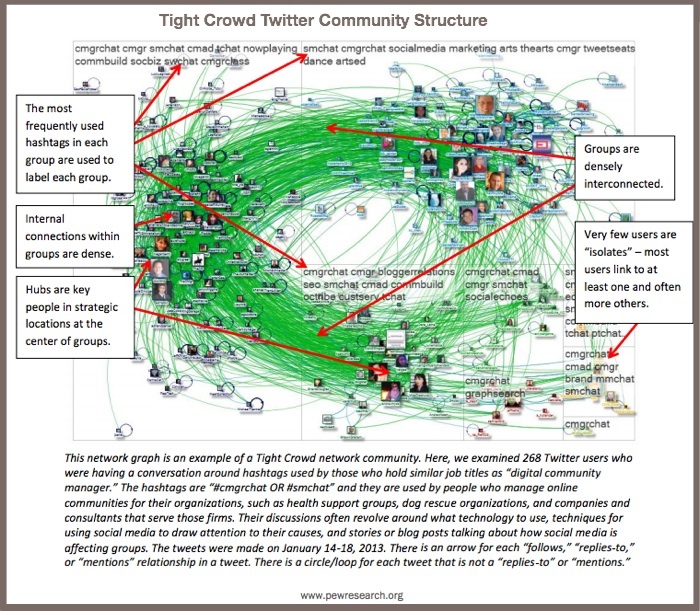 Monitor this Twitter Community Structure for new topics and diverse opinions. This provides insights for new content and conversations. Consider cultivating your own sub-group to expand your audience. Take care not to steal another brand or organization’s social media audience. Remember social media is about playing nice with the other children. 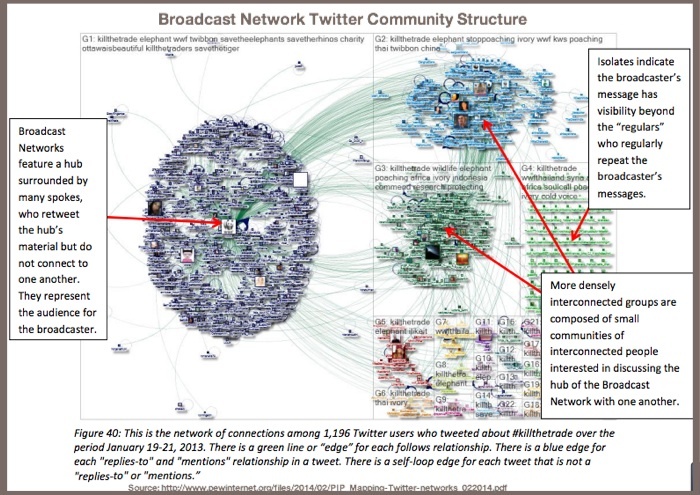 The Broadcast Network Twitter Community Structure has a hub and spoke structure. At the hub is a media outlet or influential social media figure. The spokes are people who repeat the hub’s message. The audience is generally only connected to the information source, not each other. Note that most of the messages emanate from the hub while there are sizable connected groups. By contrast, the bar chart shows a medium level of cross group communication. These examples are for a not-for-profit hashtag. It also works well for media outlets. 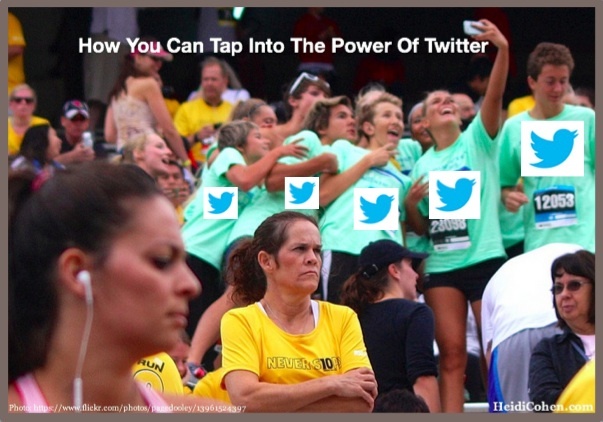 Leverage the power of your Twitter following to disseminate your message. This only works if you have a sizeable, engaged following. Of course, you can start small and build. For example, Content Marketing Institute has an on-going conversation and weekly Twitterchat around their #CMWorld hashtag. Support influencers in your area of expertise by relaying their message. Take this one step further and provide a new context for the message to enhance its reach and relevance for your audience. Work with influencers to persuade them to broadcast your message. Think in terms of paying it forward. Don’t just send them a tweet or an email trying to get their attention without helping them. In this Twitter community structure, conversations revolve around a singular source. For example, participants seek Customer Service help via Twitter. 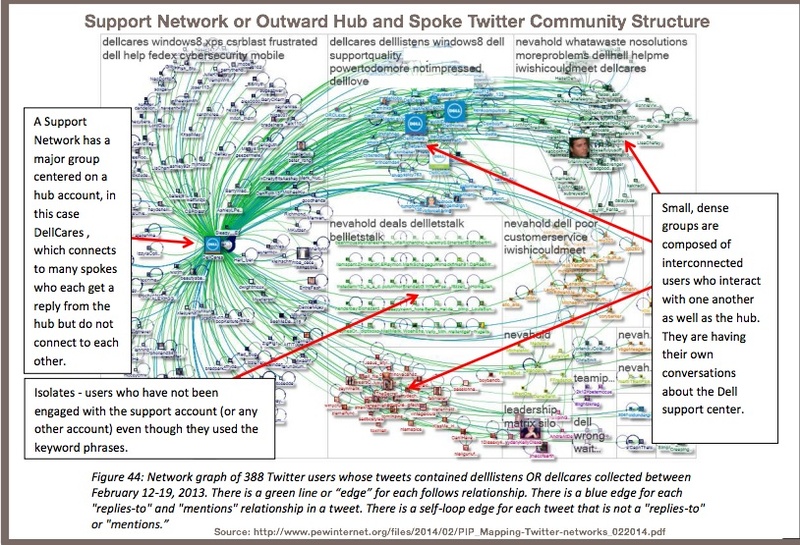 In the Support Network Twitter Community Structure, the messages go from one focal or hub account to lots of otherwise disconnected users creating the outward hub. There’s little or no replies or retweets. Here’s an example of #DellHelp and #DellListens. You can see the outward direction of the tweets. Provide customer service via Twitter. Understand that this requires different personnel skills than your existing customer service. Also, be prepared to respond quickly due to consumer expectations on social media. Use Twitter for time-sensitive communications. This works well for mass communications, where people are probably viewing at least one screen, such as airline information. If you do this, make sure that you have redundancy built into your communications since it’s a sure bet that you’ll have customers who aren’t online. By understanding how people form communities and communicate on Twitter, you can assess how your prospects, influencers, customers, fans and the public respond to your communications and interactions on this social media platform. Armed with this information, you can better tailor your Twitter activity thereby tapping into the power of this platform. 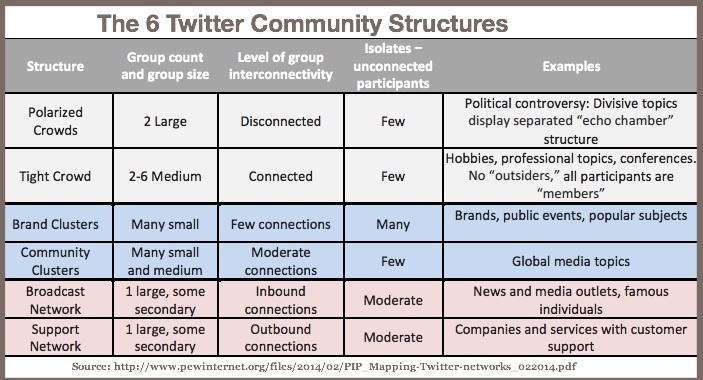 Have you tailored your Twitter activity based on community structure? If so, what have your results been? P.S. Don’t forget to use these 16 ridiculously easy ways to increase retweets! 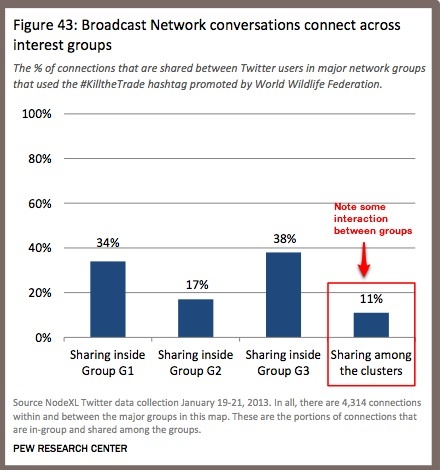 Tags Actionable Marketing Tips, Chart, Pew, Research, Twitter, Twitter community. Bookmark the permalink.